OS grid reference SD 9006 3373. 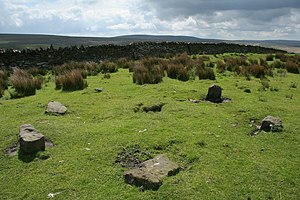 On the moors to the east of Burnley some 2 miles north-east of Worsthorne at Hellclough Head is the prehistoric site known as Delf Hill Cairn Circle. The site can be reached best via Haggate and Cockden, then along Shay Lane, Monk Hall lane, and then by walking due south-east across Extwistle Moor to the concrete trig pillar no 2049 on Delf Hill, which is 378 feet. About 77 metres to the east of the trig point lies the low mound forming the cairn with small stones jutting out, close to a drystone wall. The area around Extwistle Moor abounds with tumuli, cairns and ancient earthworks, and so it’s well worth having a good look around. The Lancashire town of Burnley is 3 miles to the west and Nelson is roughly 3 miles to the north-west – as the crow flies! The cairn circle, sometimes wrongly called a stone circle, covers an area roughly 5-6 yards in diameter with a central, small mound and ditch, while the outer low bank has 6 small stones jutting out of it, 2 of the stones are still in an up-right position. The stones vary in size between 12 to 18 inches high. Originally there were 7 stones here but this one was probably robbed away or used in the wall nearby. At the centre of the cairn circle a cist-type burial was excavated with two small urns containing bones, charcoal and flints inside a small chamber or pit surrounded and topped by stone slabs. 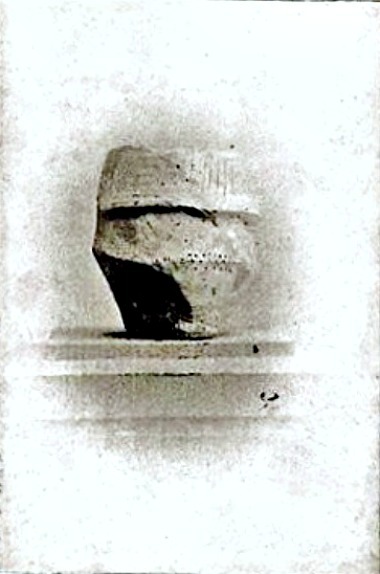 The two small funery urns were of the collared ‘Pennine type’ with faint patterning and stippling on their sides, which probably date from the Bronze-Age. Recent quarrying around the cairn circle has luckily not caused much damage, though farming methods are another kettle of fish! In the same area there are prehistoric earthworks at Twist Castle, Beadle Hill and Swinden, and there are numerous burial sites (tumuli) on and around Extwistle Moor. Gomme, G.L., The Gentleman’s Magazine Library-Archaeology-Part 1, Houghton & Mifflin Co., Boston, 1886. Thanks also to Paul Bennett, The Northern Antiquarian, and to Mr Donald Jay of Nelson for the use of the image. Categories: Cairn / Cairn Circle, Delf Hill Stone Circle on Extwistle Moor near Burnley | Tags: Delf Hill Cairn Circle on Extwistle Moor near Burnley Lancs | Permalink.